For those unfamiliar with crystal work, gemstones and crystals have been used for thousands of years in spiritual and healing practices. Eastern medicine systems such as Traditional Chinese Medicine and Ayurveda use gems to balance energy and promote wellness in the body. The properties of the stones are said to emit and amplify or absorb certain elemental vibrations. For those who find this a bit too new age-y, think of a clear quartz crystal used in a watch to hold the precision of time. Quartz has an exact frequency that is stimulated to vibrate by the mechanism of the watch, which is calibrated to mark the seconds based on that vibration. It keeps true time. In energy medicine, clear quartz is used to amplify the focus of intention and to help with manifestation. I can see the relationship. To me precision translates to purity. So I liken quartz to purity. And I liken this post’s featured crystal to purity of love. Allow me to introduce, Rose Quartz. Rose Quartz is a beautiful pink stone that is indicated for healing the heart chakra and in times when we need to amplify the love. Rose quartz is unique in that generally stones used for chakras match the color of the chakra. While the heart chakra is associated with green, crystals associated with heart chakra balancing and healing are both green and pink, the rose quartz being one of the most recommended. Pink in color therapy is used for softening matters of the heart like grief and sadness and promoting emotional love. Interestingly, on the science side, the color pink does not have its own pure wavelength and frequency as it is a mix of the two polar opposite colors in wavelength and frequency: violet (380-450nm/680-790THz) and red (625-740nm/405-480THz). On the healing side, this makes perfect sense to me. Of course, the purest expression of love, the most precise, would be found in the crystalized balanced frequency of our root (red) and crown (violet) chakras. The two polar opposite centers of our bodies’ energetic system. The flow between the two can only be maintained with a heart tuned in to unconditional love. Like the quartz in a radio, rose quartz can help us tune into the frequency of pure love. Does this mean we need only put on a rose quartz bracelet and all sadness disappears? No. Nothing in this world is going to do our work for us. But rose quartz crystals can help to amplify those qualities of unconditional love like compassion, forgiveness, and nurturing when we meditate on them, focus our attention on them and express them. That is the way of crystals. Like tuning forks to the purest essences of their own particular blend of elements, they stay true to their expression and help us find our way back to alignment. We can hold rose quartz in our hand or wear a rose quartz pendant when we wish to tap into its qualities. We can lie in meditation with rose quartz on our heart centers or hold a piece between our hands as we pray. 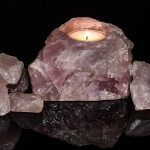 We can place pieces of rose quartz around our home to promote the amplification of love in every one of its spaces. We can charge distilled water with crystals and rose essential oil or another emotionally balancing oil and spritz ourselves with it to bring ourselves back to our intention. There are endless ways we can use rose quartz. The most powerful are usually the ones we intuitively find on our own. The beauty of crystal energy medicine is there are no contraindications so we can feel free to play with their energies and see their effects for ourselves. If you have used rose quartz for your own healing and magic, please feel free to share your experiences in the comments. If you would like to work more with Rose Quartz, I have written up a simple love ritual and listed some of its common associations so you can bring in other tools to help with your heart work. Begin by honoring yourself and the love within. Draw a rose scented bath with candles and rose quartz crystals or meditate with rose quartz on your heart to get clear and centered on your intention. Create a sacred space and invite the elements (and directions if it is in your practice) in whatever way you feel. Some ideas: Place rose petals in water in the west (you can infuse rose petals in water in the waxing moonlight for added magic), place rose quartz in the north for earth, place a lit candle in the south for fire and place rose incense smoke in the east for air. Center yourself in the middle and visualize or walk the perimeter to create a circle as your sacred space. Center and ground and bring your awareness into the sacred space in whatever way you choose that fits your faith and practice. Whatever way you enter a state that allows you to let go of your surroundings and commune with your source. It can be a formal incantation or a personal heartfelt prayer centered on love and bringing more of it into your life. Find love’s frequency and feel it filling you. Give thanks that you can tap into this frequency and sit with it until it feels familiar. Then ask for more. You can offer something in return, it can be burying rose quartz under a special tree, offering whatever thing is sacred to your deity, or perform a random of act of kindness as an offering to life itself. I am not of the belief that we have a different source nor do I believe any one faith holds the rights to salvation. I truly believe all is love. And however you feel intuitively guided to create a space for love in your life, trust it. But understand, our capacity to receive love is bound only by our capacity to give love. And our capacity to give love is proportional to our love for ourselves. As you work your love magic remember to give yourself your unconditional love. When you feel self love, you will vibrate with love. And vibrations harmonious with love will naturally find their way to you. Know you cannot force another’s love and even if you could, it would not be true. Hold on only to love itself and be open to receiving it. Allow the expectation of what it looks like to fall away so you can make room for something even better to manifest.